Situated close to the city centre, Edgbaston Reservoir is a Site of Importance for Nature Conservation. It was built in 1827 by Thomas Telford as a top up for Birmingham canal system and is still used for that purpose today. The 70 acres site is mainly open water and supports a variety of birdlife; it is also a valuable city site for animals such as newts and bats. A belt of woodland and grassland encircles the reservoir providing an oasis of natural beauty in an urban setting. There are currently no public toilets on site. 14 of the parks have pools where fishing is allowed. 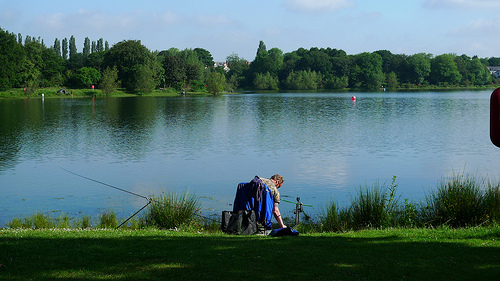 Sutton Park National Nature Reserve - only 4 pools can be fished: Blackroot, Bracebridge, Powells and Keepers Pool. There are no fishing areas on parts of these - please contact Sutton Park Visitor Centre for further information. Please note that fishing is no longer allowed at Witton Lake. Matches must be booked in advance via the use of parks form. The site operates an annual closed Season from 15th March to 15th June inclusive, so there is no fishing during this time. The site can only be fished during site opening hours. The site opens at 7.30 am and closes at dusk.